Have you ever felt a tingling fear in your stomach while waiting for your suitcase at the luggage carousel and thinking that maybe you needed some luggage protection? Is my bag coming or has it been lost? Is it still in one piece or has it fallen apart? The bloom of low-cost airlines has facilitated frequent flying. By the end of this year, people will have taken almost 4 billion flights worldwide (compared to 3.7 billion in 2016) and checked in more than 4.5 billion (!) bags. As a result, travelers should be ready to deal with the consequences, such as increased workload for luggage handling systems and, unfortunately, bigger chances of their baggage getting lost or damaged. The fate of your luggage during your trip depends on many factors: departure and arrival country, the airline you are flying with, luggage handling standards at the particular airport and - in many cases - pure luck. To help you stay out of trouble during holidays or business trips, we have listed 8 situations where your luggage is at risk while you travel. Then, we've offered practical solutions for luggage protection. Ever wondered what happens to your bag after you check it in? If you are ready to go on a wild roller-coaster with your suitcase, watch this behind-the-scenes video made by Amsterdam's Schiphol Airport. You'll be shocked! Some might say that scars make a man. However, this rule does not apply to the suitcase world. Seeing your beloved travel companion sliding out of the ominous luggage hole, covered in scratches and cuts, can easily spoil the beginning of your trip. You might think you aren’t going to sweat over such trifles while sipping cocktails on the beach. However, that nagging thought of your new, beautiful and freshly damaged suitcase might come to mind more often than you’d like if you do not have any luggage protection. And even if your bag endures the flight safe and sound, there's still a chance you can accidentally scratch it yourself. For example, when moving it on airport baggage trolleys or putting it in the car trunk. The simplest solution is to get a protective luggage cover. It cocoons your bag and prevents it from rubbing against other bags and protects it from sharp objects that your bag can face during travel. Go for a reusable textile cover that will not only be great luggage protection cover but also make your bag stand out and look classy. So, here you are - standing at the arrival belt, watching bags being collected one by one, desperately hoping for your suitcase to be the next one the menacing hole spits out. But as the baggage hall gets deserted, you have to accept the painful truth - your bag has gone missing. Discovering that your suitcase is delayed or lost might just be the worst start for your holiday. In fact, statistics from 2016 show that airlines worldwide still lose thousands of luggage bags every year, which cost them over $2.1 billion dollars. Every time you travel, there's a chance your luggage can get lost in airports’ baggage handling labyrinths, go missing during transfer or - brace yourself - can actually be stolen. Luckily, there are several simple ways to avoid losing your travel bag - temporarily or forever. Always attach a name tag to your luggage, preferably outside and inside. Your name, phone number and/or email address is enough information for the airport staff to be able to contact you in case you and your bag get separated. Keep in mind that airport staff process thousands of bags every day, so your bag gets a second of their attention. Therefore, remember to remove old luggage tags from your previous trips to avoid any mistakes. Avoid connecting flights whenever possible - data from 2016 show that 47% of baggage mishandling occurs during transfer. Pro tip: If you are travelling with several suitcases, match their models and colors - this way, the baggage handlers will be more likely to move them together. Is there anything worse than discovering someone has been rifling through your suitcase? Electronics, jewelry, perfume, and cash are usually the first victims of theft from checked baggage. Finding out that something valuable or dear to you has gone missing is a real bummer and extremely frustrating. Well this would not happend if you had a luggage protection. Even though most luggage handlers and airport staff are honest, your baggage can still meet a few crooked people on the way. Your belongings can also be in danger from dishonest passersby or a fellow passenger. Mind that your cabin bag is also at risk unless you watch it carefully and keep it close to you. Avoid placing valuables in your check-in luggage. If you must, always use a lock on your suitcase. Alternatively, you can use disposable zip ties that will prevent villains from tampering with your bag. 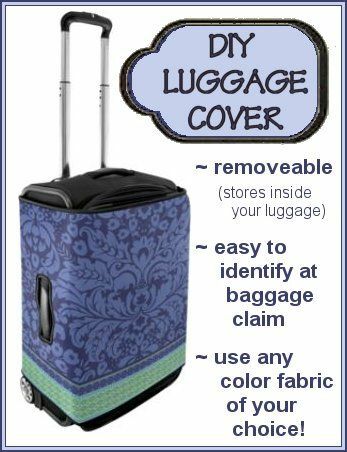 Make your suitcase stand out with cool luggage protection cover. Thieves will be less willing to choose a colorful bag with glitter stickers or a design cover than yet another black suitcase. Luggage that looks just like hundreds of other bags will attract less attention and, if caught in action, thieves can pretend they’ve simply made an innocent mistake. Take pictures of all items in your luggage before you give it away. Also, keep the receipts of any new valuables you pack in the bag. That way, you'll be able to prove possession of these things in case they get stolen. Dirty luggage after a flight - that's something we all have experienced. In fact, it's more than likely your suitcase will get dirty during your trip. And I’m not only talking about visible dirt and stains, but also a horde of germs and bacteria having a feast of your bag and this is another reason why you need luggage protection. Every suitcase is handled by check-in agents, airport employees, security screeners, ground handlers, and staff who prepare flights and transportation. Then, it's loaded onto the aircraft and later unloaded for transfer or delivery to the luggage carousel. Imagine yourself going through the same stages. I bet you’d feel like having a shower. For five hours. Use a textile luggage protection cover that's easy to wash. After the trip, simply take off the cover and throw it into your washing machine. Luggage wrapping can be useful, but it has many drawbacks. First, it's just ugly and oftentimes leaves ugly marks and traces on your suitcase. Second, this service is usually rather expensive - starting at €12, depending on the company providing the service. Wrapping your bag for one return trip will cost you €24 or more. That is basically the price you'd pay for a much better-looking textile luggage protection cover that can be used over and over again for years. Third, sometimes airport security staff can cut the wrapping to check the contents of your bag. So, the wrapping can get removed even before your bag reaches the plane. What a waste of money, eh? And finally, plastic luggage protection wraps are extremely planet-unfriendly. Plastic waste is a huge problem nowadays, yet most luggage wrapping services don't care if the plastic is recycled afterward. Get a reusable luggage protection cover that will protect your suitcase the same way a plastic wrap does. Besides, unlike the plastic, the reusable covers come in various designs to choose from, so you can add personality to your travel bag. If you are into handicrafts, you can also devote 3 hours of your time and make a suitcase cover yourself. Depending on the chosen fabric and design, it will cost you €10 - €15 in materials (for a bag with the size of 22x35x56 cm), and let you save €18 - €13 that you'd spend buying a ready-made cover like this one. Have you ever almost taken another person’s bag at the luggage carousel? We’re only human, and these situations happen. Especially because many bags look so similar - rectangular, dark, wheeled. Or they might even BE the same! If something comes from global retail stores or is purchased on special deals, thousands and even millions of people can end up with the same product, but not if you have interesting and colorfull luggage protection cover. Decorate your suitcase to make it stand out and emphasize your style at the same time. A bit of hip decor, like a flashy luggage strap, funky stickers, or some stylish stencil art will make your travel bag impossible to confuse with another one. Get a luggage protection cover with a unique design that will allow you to spot your bag easily as you collect it from the luggage carousel. If none of the above, at least attach a name tag to your bag, so you can recognize your bag without opening it and checking its contents. Cabin pressure makes it more likely for some liquids to start leaking inside your bag. What you didn't know is that the problem is not the liquid or the container - it’s the air inside it. Put simply, if there's air left in your hand cream, toothpaste tube, or any other container, it will expand and can burst. Even if you've packed your suitcase perfectly, fellow passengers might have been less diligent. It’s enough for a shampoo bottle or a jar of grandma’s pickles to burst in your neighbor’s suitcase, and your bag will suffer. Not only it is possible that something explodes in your or your neighbor's bag, but your suitcases can also get soaked from rain during reloading. Pack your bags wisely to avoid liquids leaking under pressure: shake or bounce creams and other flexible containers to the bottom of the tube; then squeeze to push out the air before putting on the cap. For extra caution, place rigid containers, like bottles, in leak-proof bags first. Pack all your things in ziplock bags. The bags will prevent your belongings from getting wet from the liquids in your bag, as well as save them from pouring rain. When buying new luggage, look for waterproof options. That way, your belongings will stay dry and safe from any water or other liquids attacking from outside or get waterproof luggage protection cover. Most of the time, bags aren’t being treated with care and affection by the airport handling staff. They are thrown, dragged, squeezed, and put under a lot of pressure. After countless breathtaking throws and one 360° backflip, your loyal valise can finally capitulate. You might think that high-end brands make durable suitcases that will survive all the throwing, punching, and shoving. And maybe you're right. However, manufacturers are skillful sellers and, in fact, secretly hope that their bag will fall apart one day, so you'd have a reason to buy from them again. Pack duct tape with you - it can fix almost anything. Broken zippers? Yep! Slits? No problem. Torn handles? Watch me! Besides, duct tape can also be useful for other situations during your trip. Prevent your suitcase from falling apart with a tight luggage protection cover. It will keep your luggage together and your belongings inside, even if your bag gets damaged or breaks open. Lesson learned? Now you know why luggage protection is important. Lost or mishandled baggage is still one of the biggest areas of complaint about air travelers. Problems with travel bags cause inconvenience, frustration, and very often - unforeseen expenses. The good news is that the airport systems are improving and, little by little, introduce new luggage tracking technologies. The new rules by the International Air Transport Association (IATA) will require airports to share tracking information of all baggage to improve customer service and luggage protection. At the same time, no rules will ever protect your bag from being scratched, stained, or soaked. Therefore, follow these simple luggage protection tips to protect your bag and consider buying travel insurance for your checked bag. Better safe than sorry, right? And finally - If something happens to your luggage, despite all the preventive measures, know your rights and always claim damages from the airline. The compensation can be generous enough to buy you a new suitcase. HAVE YOU EXPERIENCED DAMAGED OR LOST LUGGAGE? SHARE YOUR STORY IN THE COMMENTS BELOW!